This entire drainage - from 1,975 feet up at Dixie to 3,850 feet along the top of Biscuit Ridge - represents three classic northern Blue Mountain life zones. 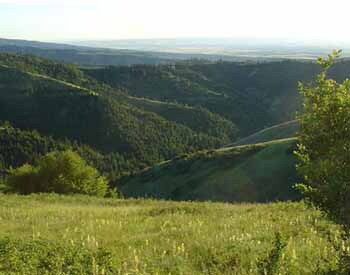 The low-elevation areas are prime riparian areas with dense stands of hawthorn, willow, river birch, alder, and cottonwood. Mid-zone sites are scattered with Ponderosa pine and snowberry, with a mix of grasses and forbs. The higher-elevation zone hosts Douglas-fir with aspen, oceanspray, ninebark, and huckleberry. The south- and west-facing slopes are mostly free of trees due to shallow, dry soils covered with grasses and low forbs, while the north- and east-facing slopes are wet, deep-soil sites with dense stands of shrubs and large conifers. Precipitation ranges from 17 inches near Dixie to nearly 28 inches along upper Biscuit Ridge. Intensive agriculture surrounds this area at its lower elevations. There are large numbers of berry- and fruit-producing shrubs and trees, including hawthorn, currant, and wild plum. Biscuit Ridge is unusual in that it affords large numbers of species outstanding breeding habitat due to marked changes in elevation. Many springs, small creeks, and seeps provide ample water through the hot breeding season. Large numbers of insects inhabit this site. This area is rich in birds during the breeding season. The resident species include Ruffed Grouse, Hairy Woodpecker, Song Sparrow, Northern Goshawk, Red Crossbill, Winter Wren, and Bewick's Wren. There are about 43 species of expected residents in this drainage. The migrants are the big deal here. This area has all the lowland passerines as well as all the highland birds - everything from Yellow Warblers to breeding Yellow-rumped Warblers. There are Willow, Dusky, Western-type, and, rarely, Least Flycatchers. There are Calliope, Black-chinned, Rufous, and, again rarely, Broad-tailed Hummingbirds. Look for Cassin's Finches and Green-tailed Towhees, also Great Gray Owls, Northern Pygmy-Owls, and Chestnut-backed Chickadees. A good local map is a must here. Take Route 12 east from Walla Walla. Turn right (south) at the Dixie School. Punch your mileage to zero here! You will be on Upper Dry Creek Road. Follow it south for 2.3 miles to the hummingbird crossing and stop at the Tom Lamb home. Best from May to mid-June and August through early September. Tom maintains 30 hummingbird feeders, and during spring migration there can be upwards of 300 hummers in his yard. Evenings are best. Your next stop must be Seaman Road, the first road to the east, only 400 yards south beyond Tom Lamb's place. Turn off Upper Dry Creek Road, and drive past the farm on the left. Park off the road, and walk and bird along the lower two miles of this county road. Return to Upper Dry Creek Road, turn left, and proceed on down the road. All of the land along this road is private, so please do not trespass. Bird along the road when you reach the hawthorn-scrub forest off to your right about 1.2 miles beyond Seaman Road. Folks living in this area mostly want to be left alone, so it is not a good idea to leave the car in the middle of the road while you look at birds. Be aware that most homes in this area have numbers of large, free-ranging dogs. The Green-tailed Towhees are located along Biscuit Ridge Road at three different stops: .5-.7 miles beyond the end of the pavement along the steep grade (also watch for Least Flycatchers here); at mile-marker 1.3; and at mile-marker 9.2. Great Gray Owls are also in the area and should be looked for between 8.1 and 9.2. This road is steep and not a good idea to attempt a trip during wet weather. Never drive up here during the winter! Food and other services are available in Walla Walla, Waitsburg, and east into Dayton. Warning: This area is steep and roads can be rough, so be aware of your limitations. Black bears inhabit the area. Spring brings out ticks, and mid- to late July can bring out black biting flies. Come prepared, and enjoy this beautiful area and its great birds!